When Edgar Mohrmann, a businessman from Lübeck, Germany, founded an auction house for stamps in 1929, no one could have guessed that he was going to lead this firm to worldwide recognition and an international standing within the next few decades, despite all the political turmoil that ensued. At over 200 auctions over the last 80 years, the greatest rarities were auctioned off and a market was created which brought together buyers and sellers at a high-calibre level. Edgar Mohrmann contributed substantially towards the emergence of the term "shares for the man in the street" as a financial synonym for stamps. Ever since the first stamps began to cast their spell over people in 1840, the fascination with philately has prompted millions of collectors worldwide to take an interest in these small, colourful treasures. Depending on the prevailing tastes of the times, collectors' habits and preferences changed constantly: new regions for collecting came into vogue, only to be forgotten again. Good instincts and precise knowledge surrounding these occurrences, as well as firm expertise in the subject matter itself, are indispensable prerequisites for anyone who wants to assert themself in this market. 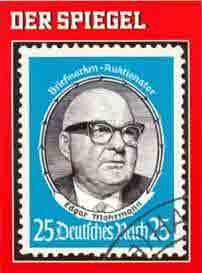 "Der Spiegel", a German news weekly, dedicated a 12-page cover story to Edgar Mohrmann in 1962. Following his death in October 1964, other renowned philatelists went on to manage the Mohrmann house, among them Wolfgang Jakubek, Manfred Mylius and Ekkehard Lambrecht. Today Hans-Peter Bahr, a graduate in business management, is in charge of business dealings at the auction house. 80 years after it was founded, the firm Edgar Mohrmann continues to be a guarantor for good auction results, respectability and discretion.